From the Editor: The lack of sight in no way limits a child's ability to learn or to perform ordinary tasks. It simply means that the child will learn in ways that do not involve vision. Although this fact may seem obvious, the shift to nonvisual thinking does not always come naturally to the parent of a blind child. In this article Michelle Murrey describes how she is learning to slow down and pay attention to sounds and textures as she teaches her daughter, Mikaela, about the world. Raising a child in 2018 is no small task. With the onslaught of social media, wrenching political differences, and technology that changes as quickly as the weather, it is hard to decipher what is best for any child. Yet raising a child who is blind brings with it a unique set of challenges—especially if that child has been blind from the earliest years of life. 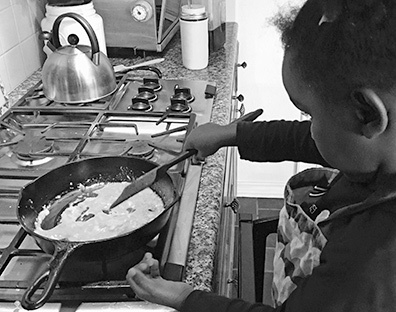 Last night, as I prepared scrambled eggs for dinner with my three-year-old daughter, Mikaela, I reflected on the difference she has made in my life since her arrival. Preparing the scrambled eggs did not happen while she played contentedly in the next room. Instead, she walked with me to the refrigerator to choose the eggs from the carton, selecting three. She carefully carried an egg, placed it on the counter, and climbed onto her stool. On the counter was a tray with a small bowl. A no-slip liner underneath kept the bowl steady. Mikaela picked up an egg, and I guided her right hand as we tapped it on the side of the bowl together. Two more times we repeated these steps, putting the shells in the sink after each one cracked and the yolk fell into the bowl. Mikaela picked up the fork, and together we scrambled the eggs. She tilted her head ever so slightly as she listened to the slosh of the eggs and the sound of the fork scraping against the sides of the stainless steel bowl. Before I turned on the stove, I stopped for a moment to guide Mikaela's hand gently to the stove surface. I reminded her that the smooth metal gets hot when the burner is on and that it feels different from the slightly bumpy texture of the countertop to her left. Together we cut a pat of butter, and Mikaela dropped it into the pan. We listened to it sizzle and smelled the aroma of melted butter that wafted through the air. Together we picked up the bowl and poured the eggs into the hot pan. Mikaela listened as the eggs began to bubble. We held the long silicone spatula and began to stir. I commented on the liquid texture of the eggs as they slipped around the pan, almost weightless. Then we rested the spatula on the counter and began to count. Twenty-eight . . . twenty-nine . . . thirty. We picked up the spatula again, and this time Mikaela pushed it around the pan herself. We talked about how the eggs were thicker, heavier. She sniffed a bit, noticing the smell of the eggs beginning to cook. Again we rested the spatula on the counter and counted. Twenty-eight . . . twenty-nine . . . thirty. At this point the eggs were thick, stiff, and ready to put on the plate. "Mama, I don't want them hot," Mikaela said. She climbed down from the stool, careful to keep her hands off the hot stovetop. Mikaela walked to her chair and said, "Come on, Mama. Let's eat scrambled eggs." I joined her at the table, and together we carefully scooped some egg onto her spoon. She touched the egg to her lips. "Too hot, Mama. I want them warm." So we waited a moment until the eggs cooled. When she tried again, the temperature was just right, so she took a bite. "Yum, Mama." Food often tastes better when cooked with our own hands, doesn't it? That whole process took about fifteen minutes, instead of the five minutes it would take if I did it on my own. Throughout the process my busy, chatty daughter was still, quiet, attentive. We worked together as a team to accomplish the task. We respected one another, working as a unit, often hand-in-hand. Together. In moments such as these I realize that parenting Mikaela involves a beautiful trust and closeness. We have slowed our pace and learned together what melted butter smells like and how eggs sound when the yolk hits the hot pan. Before Mikaela came along, I served as foster mother to eleven other children. Though some of the children had special needs, they were all pretty typical. We had the average toys, did average things, and maintained a pretty busy lifestyle. We shopped at Target for toys and knew nothing of IEP meetings, tactile drawings, long white canes, and Braille books. With Mikaela I've had to slow my pace. I've learned to pay more attention to the smells and sounds around me and not just to rely on my vision to give me critical information, as I had with my other kids. I've learned to describe what is happening in significant detail, noting the sounds of a Mack truck versus a school bus versus a city bus. I've learned to shop for toys on the APH (American Printing House for the Blind) website or at the NFB Independence Market. And we spend our vacations in Orlando, Florida, with two thousand of our dearest friends and mentors. Mikaela has been blind since birth. I have come to appreciate and celebrate the way she experiences the world through the tips of her fingers and the depths of her ears. She has taught me to slow down, to pay attention, and to find ways to describe many intangible parts of the world that I once took for granted—things such as rainbows, shooting stars, and the deep blue of the midday sky. Parenting Mikaela is not always easy, but it is beautiful, and for that I am grateful.